Most of us would think that the only device that has a QWERTY keyboard imprinted on it comes in the form of a smartphone, but ThinkGeek has something different this time around to tease you. We’re talking about the QWERTY Premium Leather Wallet, and you can tell by its name that “investing” $39.99 in it would make you own one of the geekiest money holding equipment in the market! 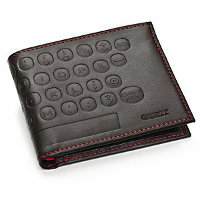 This premium leather wallet will feature embossed keyboard keys, sporting half a dozen slots for cards, a couple of folding money pockets, in addition to two hidden pockets. The red lining inside does resemble that of a typewriter ribbon for old times’ sake. There is also an “All work and no play…” quote embossed on the inside of this wallet, slowly nudging you to make purchase decisions with whatever money you have left inside to make sure you don’t end up as the dullest boy in class – or at the office.